Free the Last Ayleid King. This tower is a lightless oubliette, a prison of darkness that binds King Laloriaran Dynar, the last Ayleid King. Retrieve the Light of Meridia from underneath the tree. Collect and place the three crystals. Destroy the two receivers binding the Ayleid King by rotating crystal prisms. Enter the portal to the Hollow City. Enter the Fighters Guild Training Grounds. 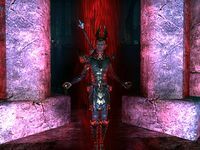 When you first arrive, a projection of King Laloriaran Dynar will appear and ask you to retrieve the Light of Meridia in the front room. It is underneath the large tree to the left. You can move one of the roots to get in, or go around the back, where there's a small gap you can fit through. Enter the Lightless Oubliette tower. You need to recover three crystals: Lifeshadow, Mindshadow and Flameshadow Crystals. The Mindshadow Crystal is at the south end of the room, in the library. Take the red crystal at the southernmost end, then use the library gate switch for a quick way back into the main area. The Flameshadow Crystal is inside the Frozen Alcove. Take the red crystal from the end of the Alcove. Once you do, the Frozen Alcove will begin to melt as lava seeps in through the floor. The Lifeshadow Crystal is at the north end of the room, in the garden. Take the crystal at the bottom of the stairs, then use the library gate switch at the top to exit quickly. From left to right, place the Mindshadow, the Flameshadow and the Lifeshadow Crystals. You can place the crystals whenever you want; you don't have to collect all three, then place them. After the crystals are in place, enter the Ayleid King's prison and set him free. Activate the first crystal prism to the left. Follow the light beam to the last crystal, the third lit one, and press it three times. Press the crystal that lights up five times. Repeat this process of activating the last lit crystal until the next one lights up until all the crystals are lit, and the prompt destroy the north receiver is complete. Next, you need to do the same thing to the south receiver. Place the light of Meridia in the crystal prism in the southeast corner, then rotate the crystals around. For the second crystal from the southern receiver, make sure the beam of light is headed to the crystal closest to the receiver. Destroying both receivers frees the King. Talk to him, then follow him as he limps to the eastern side of the room and opens a portal to the Hollow City. Enter the door to the Fighters Guild Training Grounds, then climb the stairs and talk to the King. 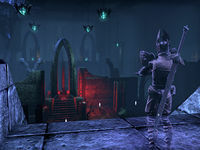 The Light of Meridia can be used within the ruin to brighten the area. Passing near an Essence of Darkness will dispel the light. It is possible to enter the Lightless Oubliette without having completed either of the Moonless Walk quests. If you do so, however, the Light of Meridia will not be there. You can still enter the darkened areas where the three Crystals are found, and fight the enemies here (you'll another light source unless you want to stumble around in the dark), but you won't be able to retrieve the Crystals and thus unlock the main chamber. The first step in setting King Laloriaran Dynar free requires that I enter the Lightless Oubliette. Now that I'm inside the tower, I need to find the crystals of darkness so that I can move them to the prison door. I placed the three crystals of darkness and unlocked the door to King Laloriaran Dynar's prison. I should enter the oubliette and see what I need to do next. I need to use the Light of Meridia to ignite the sconces so that I can direct the radiance to destroy the crystal emitters. This should release the Ayleid King from the darkness that binds him. I released King Laloriaran Dynar from the dark energy that bound him. I should talk to him and make sure he's all right. The Ayleid King opened a portal to the Hollow City. I should follow him and travel there. Finishes quest I'm back in the Hollow City. I should locate King Laloriaran Dynar and make sure he arrived safely. This page was last modified on 3 February 2019, at 08:21.